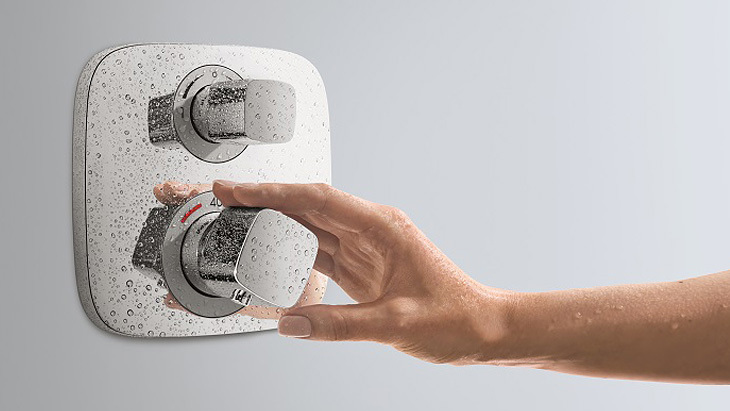 hansgrohe offers a variety of modern shower control units which control the water volume and temperature with precision. These hansgrohe Ecostat thermostats come in two design variants: square-shaped Ecostat E with rounded corners and round-shaped Ecostat S.
The flat, concealed pre-fab sets are quick and easy to install on the iBox universal. You can recommend products that have been tried and tested for many years in terms of both technology and function. You can offer your customer two design variants – for a more personal touch. Constant water temperatures. Unpleasant hot and cold experiences are therefore a thing of the past. The temperature is selected and finely adjusted via the lower control dial. Hand, overhead shower and water volume are controlled via the upper regulator. Ergonomic operation. The control elements, which are equipped with rotary handles, are extremely easy to grasp, even when your hands are slippery from the shower gel. High degree of safety. Large print makes for optimal legibility and usability – even for the older generation. Plenty of elbow room. The concealed installation creates space. Great design. Ecostat thermostats are beautifully striking bathroom features. These thermostats also enhance showers and bath tubs in terms of their technology, visual appearance and ergonomics. With their ceramic cartridges, they reliably control temperature and water volume on a consumer. With a safety lock at 40° C (scalding protection) and in some cases an environmentally friendly Ecostop button, which limits the water consumption to 10 l/min. They also feature non-return valves and silencers. Care Ecostat thermostatic mixers have extra-long handles – ideal for cross-generation bathrooms. This flat mini-computer will wow those customers who appreciate the convenience of digital control even in the shower: RainBrain. This smart system is controlled via touchscreen. It controls everything: showers, temperature, jet types, light and music. The perfect choice for anyone who wants to completely redesign a bathroom. Try out RainBrain for yourself now!